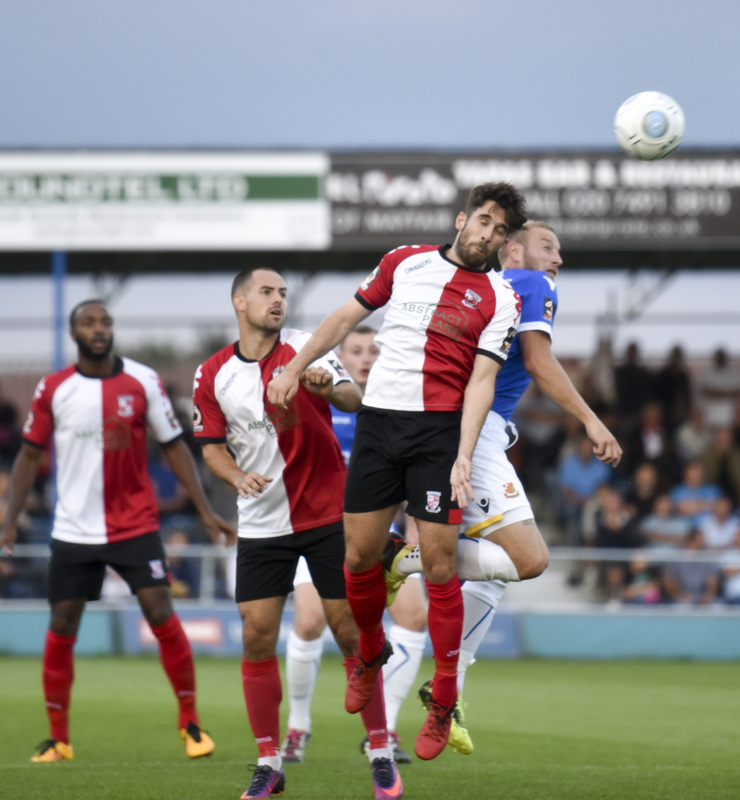 Woking ensured late disappointment at Grosvenor Vale after Wealdstone were awarded a penalty with five minutes remaining, duly converted by Matt Lench. After a first half where chances had been plentiful but none taken the Cards struggled to muster any effort on goal in a one-sided second half. It could be argued that the turning point seemed to be when forward Jake Hyde hobbled off with injury just before half time. From there on Wealdstone pushed the Cards back. Woking held on for long periods until the late penalty drama and referee Jacob Miles later added salt to the Cards wounds by dismissing full-back Daniel Spence in the dying seconds with a second yellow card for a bad foul. Despite having faced each other 18 times previously, this was the first league match between the two teams in over 47 years. Due to a quirk in the fixture list both teams had entered this evening’s game with little over 48 hours rest after both playing tough opponents in the league on Saturday. Alan Dowson made three changes from the rollercoaster victory over Oxford City in the previous outing. Kiran Khinda-John and Paul Hodges were both rewarded for their impact as substitutes on Saturday with starting places and Nicky Wheeler was recalled to his starting position on the left wing after being rested on Saturday. Those making way were Christian Jolley, Gregory Luer and Reggie Young. Woking attacked the Bulla end of the ground in the first half would benefit from a marginal slope on the pitch. Early on Kane Ferdinand played a neat one-two and attempted a volley at goal on the return pass. Though the shot was blocked the ball kindly spilled out towards Jake Hyde. However, he was muscled off the loose ball before he could get his shot away. A cross from Max Kretzschmar from the right was narrowly tipped behind by Jonathan North, keeping goal for the Stones, with Wheeler waiting expectantly at the back post for a tap-in had the goalkeeper not intervened. From the resulting corner Nathan Collier went close, narrowly heading over with a free header. Wealdstone saw their first opportunity to press forward in the 12th minute. A long cross from the right from Monakana was played back into the centre of the area by Pratt and though White stretched well to redirect the ball it was well shielded away to safety by Khinda-John. Another floated cross from Kretzschmar on the right looped into Wheeler on the back far post. However, his failure to control allowed the ball to dribble out for a goal kick. Soon after Wheeler was the provider as he chased a loose ball down the left and was able to cross for Hyde in the centre. However, he was narrowly beaten in the air by a Stones defender in the six-yard box. As Woking pushed forward in search of the breakthrough it seemed likely that Wealdstone would get opportunities to counter attack. This chance came in the 32nd minute when possession was lost by the Cards deep in the Wealdstone half. A long through ball to Pratt cut through the Cards defence and the visitors were fortunate to see his shot cannon off his teammate White to allow Schotterl to diffuse the danger. The Cards recomposed themselves and were back on the attack soon after. A Kretzschmar cross fell kindly for Wheeler in the box. After taking two touches to control he hit a fierce shot which was saved well by North, diving to his left. From the resulting corner Wheeler crossed in from the left and Hodges got ahead of his marker to redirect narrowly wide into side netting. However, three minutes before half-time Jake Hyde appeared to hobble off with an injury sustained and was replaced by Ofori-Acheampong, making his bow in a Cardinals shirt. The substitute was instantly involved by winning a free kick on the edge of the penalty area. Kretzschmar lined up take it and floated one in to the bottom left corner. Though North got across well to get behind the ball he appeared to lose control at the last moment and desperately scrambled the ball around his near post. The half ended with one last attack by the home team. Monakana crossed in from the right and was headed at goal by White. It appeared that the rebound would leave Monakana with a simple tap-in, but he was well marshalled by Casey who sensed the danger and crowded out his opponent before clearing the ball away. Now kicking towards the gun turret end the Cards seemed to find the second half an altogether more challenging proposition. It became clear from early on that the loss of Hyde late in the first half had taken away the main source of being able to hold up the ball in Wealdstone’s half. Every time the ball appeared to be passed up towards Woking’s forwards the play seemed to break down quickly and evolve into another Wealdstone attack. As such Woking found themselves largely hanging on. A free kick early in the half from White was floated into the box. Stevens arrived first and headed down to beat Schotterl. However, the ball bounced narrowly wide of the post. Ahmidi danced past two of the Woking defenders on another Wealdstone charge forward and only another good save from Schotterl denied the Stones midfielder a superb solo goal. Midway through the half Gayle found himself beaten to a fifty-fifty by Pratt who suddenly found himself clean through on goal. Fortunately, some excellent backtracking by Khinda-John allowing him to get back to recover possession. Another useful cross from the right by substitute Lench saw Pratt with a clear opportunity to shoot past Schotterl. Though his effort was put wide the Stones’ forward’s blushes were spared by the offside flag. As the half wore on the home side were turning the pressure up more on the Cards as they faced wave after wave of attack. Another cross from the left bobbled its way through to Tyler whose scuffed shot looked to find its way into the bottom right corner. Only some agile goalkeeping from Schotterl seeing through a crowd of bodies to claw away kept the scores even. However, the pressure would eventually tell in the final five minutes. A hopeful punt forward was seized upon by Pratt to go clean through. Khinda-John went with him and as Pratt advanced on goal both bodies fell together. Referee Jacob Miles took a short moment to consider before pointing to the penalty spot. Matt Lench stepped up to take the penalty kick and as Schotterl committed to dive to his right Lench placed the ball into the other side of the goal to give Wealdstone a deserved late lead. As time wound down frustration appeared to tell from some of the Cards players, with a few bad fouls given away in the centre of the field. When Spence committed a heavy tackle with seconds remaining referee Miles had no hesitation in issuing a second yellow card and reducing the Cards down to ten men. Unfortunately it proved to be the final act as Wealdstone celebrated their victory with their fans at the final whistle. With most of the league not due to play until tomorrow it allowed Wealdstone to rise up to 4th place in the table and whilst Woking remain on top, that may well change after tomorrow’s results. The Cards must now look forward to another trip around the M25 on Saturday when they take on Hemel Hempstead Town, another team to have started the season well. My MOTM: Berti Schotterl: Though it was hard to identify a standout performance from any of the Cards players this evening it must be acknowledged that Berti did everything possible to keep the Cards on a par with the Stones. Despite making a series of excellent saves it ultimately failed to be enough after Matt Lench’s late penalty secured the points for Wealdstone.